Tobias (born 1865, died 1932?) 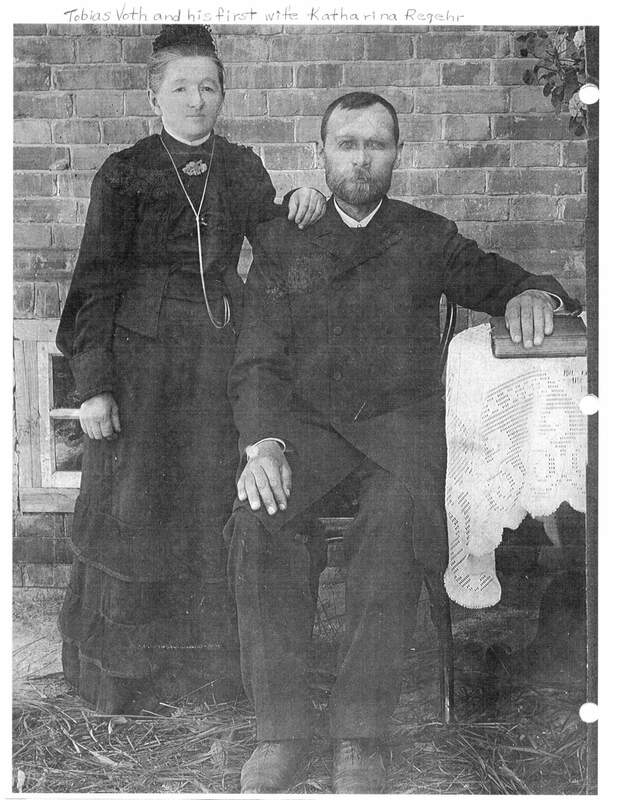 and Katharina Voth (née Reghr, born 1862, died 1921) lived in the German-speaking Mennonite colony of Neu Samara, in Orenburg Oblast. They were successful farmers, and community leaders, with Tobias operating the town mill of their village of Lugowsk and serving as a travelling minister for the church. They had five children, Jakob, Anna, Katarina, Johannes, and Susanna. Katharina died of an illness during the Russian Civil War years and Tobias remarried to the Widow Braun in 1921 (died 1932). Tobias and his wife were tragically unable to escape the Soviet Union with the rest of their family. Tobias was arrested in 1929 while seeking a passport in Moscow and sent to the Siberian gulags, where he likely died over the winter of 1932 at the age of 67. The Widow Braun returned to Lugowsk and was likely lost to the famine that began when agricultural production was collectivized starting in 1931. There is no record as to what happened to Jakob. Anna would die in Kazakhstan in 1943. Their relatives in Canada awaited news of their family in the Soviet Union for years. As the head of the family in Canada, Johannes had kept a room at the ready in the homestead in Springstein for his parents to stay in when they finally arrived in Canada, decorated with a tapestry that was the only heirloom they had brought with them. It was not until 1931 that the family received letters from Tobias in the work camps, in which he described the slow starvation he was being subjected to. An attempt to send supplies to him failed, and he died in 1932, news relayed to the family in Canada by other prisoners. Famine in Lugowsk led to the death of his wife. The legacy of their service to their community, their faith, and their devotion to their family, inspired a commitment to serving God and their fellow man. Herta and younger brother Alvin (the first Voth born in Canada) became nurses, and served as Mennonite Brethren missionaries in South America. Faith, family, and fellowship were Tobias and Katharina’s principles and Canada allowed their 3 surviving children, 17 of their grandchildren, their 54 great grandchildren, and their 76 great-great grandchildren the freedom to embody those principles in their lives, and to work at empowering others around the world to do the same. Stories like those of Katharina, Tobias, the almost 50,000 other Mennonite refugees to Canada, and the over 100,000 souls who were forced to stay in the Soviet Union must not be forgotten. What must also be remembered is the joy and hope that people can find even among the devastation of communism. As Katarina told Herta later, safe in Canada, about a freezing night in Neu Samara after the revolution but before the exodus, when the Voths were travelling to combat the effects of the ongoing famine:We were taken to their family home, where we were watched from the corner of the room, where some small children, nearly naked, skeletal, huddled together on a pile of straw and rags, too weary to move. Despite all the misery we had already witnessed, our hearts still threatened to break at the sight of their listless eyes staring from too-big sockets. We longed to take them away from their cruel world and give them all that the children in our land take for granted. Instead, we could only offer them the very last of our supplies of food and a small garment for each child. As I bent over each form to put that gift into the small hand, I felt in my soul that this piece of clothing would, in all likelihood, be the last that child would ever need in this world. There was nothing more we could do and prepared to leave. This shirt on, shirt off continued for a long time, becoming more joyful with each turn. This child’s joy seeped into all of us and banished some of the gloom that was bogging us down. If a child’s joy could revive in such circumstances, perhaps there was hope after all! Perhaps a new spring would find a seed still alive, having survived winter’s grip of death.